The Houston Texans lost 27-20 in the season opener against the New England Patriots. Tom Brady and the Patriots took full advantage of the holes in the Texans offense and defense. Brady finished the night completing 26 of 39 passes for 277 yards, three touchdowns, and one interception. 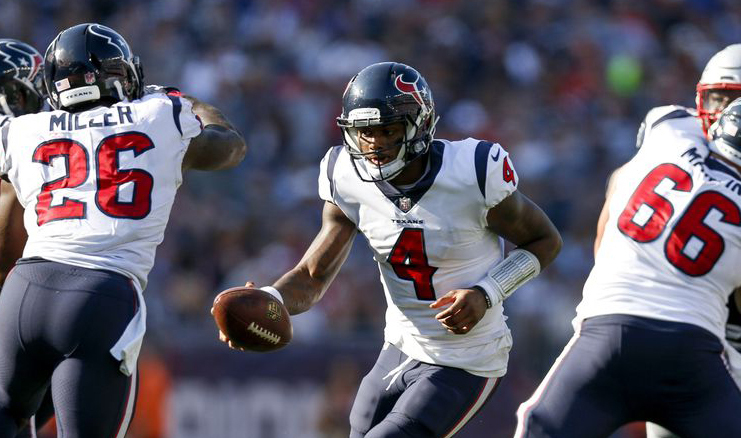 In what was not quite the performance most anticipated from Texans Quarterback Deshaun Watson, he appeared to struggle to find his rhythm throughout the course of the game. Watson managed to complete 17 of 35 passes for 176 yards; he threw one touchdown, and threw one interception. Watson remained under pressure in the pocket from a determined Patriots defense and in the midst of poor pass protection from the Texans offense, resulting in him being sacked three times. “I think it was terrible on my part,” Watson said. “I feel like you can put that all on me because I’ve [been] way better than what I showed today. My energy was low and I was just overthinking little things. Despite 12 hits he endured in addition to the sacks, Watson refused to put the blame on his O-line. “I was just holding the ball too long,” Watson explained. In a statistic generated from ESPN Stats & information, Watson was under heavy pressure on 23 of 42 drop-backs which is a whopping 55%. Apparently that is the highest pressure rates for any quarterback in the last two seasons. While football is a team effort and blame in a loss could be shared, Watson is becoming a leader in the sense that he wants to shoulder the responsibility and remains confident that the team has what it takes to move forward. Here’s hoping that the Swiss-Cheese like offensive-line doesn’t result in another season ending injury for the young quarterback with so much potential.